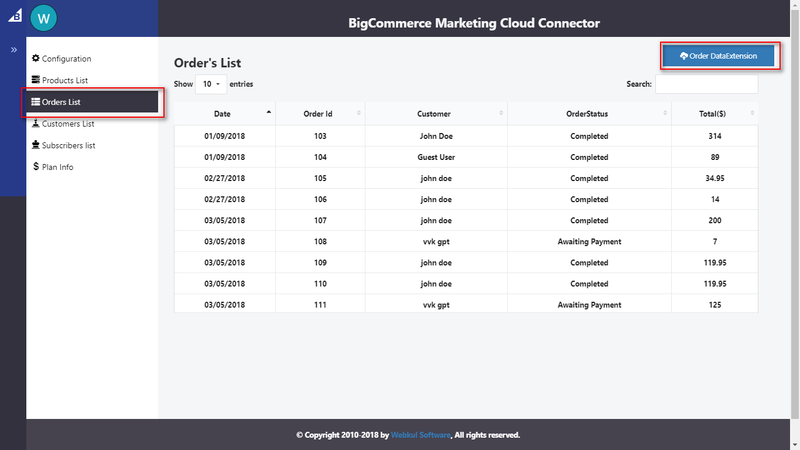 Avail unified synchronization between BigCommerce & Marketing Cloud with BigCommerce Marketing Cloud Connector. It is enhancing the features of e-commerce and CRM platform with the concept of service first approach. It enables you to sync categories, Products, Customers & Orders from BigCommerce to Marketing Cloud. Sync Products, Customers & Orders from BigCommerce to Marketing Cloud. Very easy to integrate & manage at your shop. Now you can easily run email campaigns for the customers of your shop by simply exporting the existing customers to the subscribers’ list of marketing cloud. 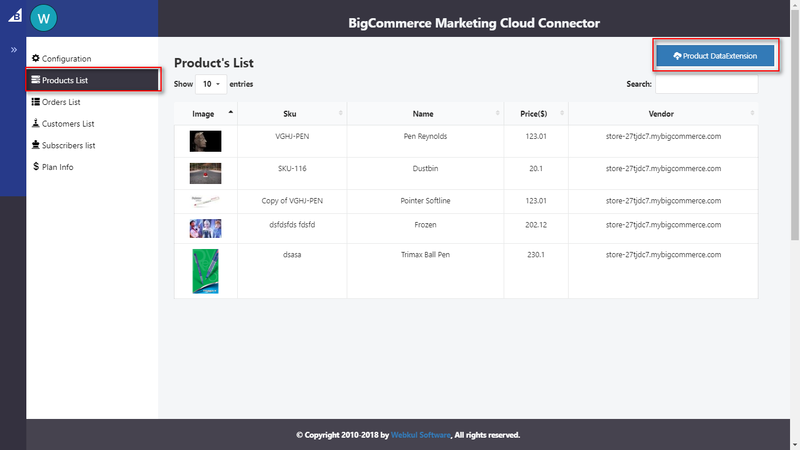 Now reach out to your abandoned carts and increase the conversion probability by fetching the abandoned cart data from BigCommerce to marketing cloud data extension table for abandoned carts. Simply sync the data and approach the target audience via various email campaigns. Go to this link https://marketingcloud.eshopsync.com/ and Select the Platform as Bigcommerce to install the app as shown below. It will take you to the login page of BigCommerce. Just log in to your BigCommerce store if not logged in. Go to apps (My Apps) sections of your store, find the app “Marketing Cloud Connector By Webkul” & Install. 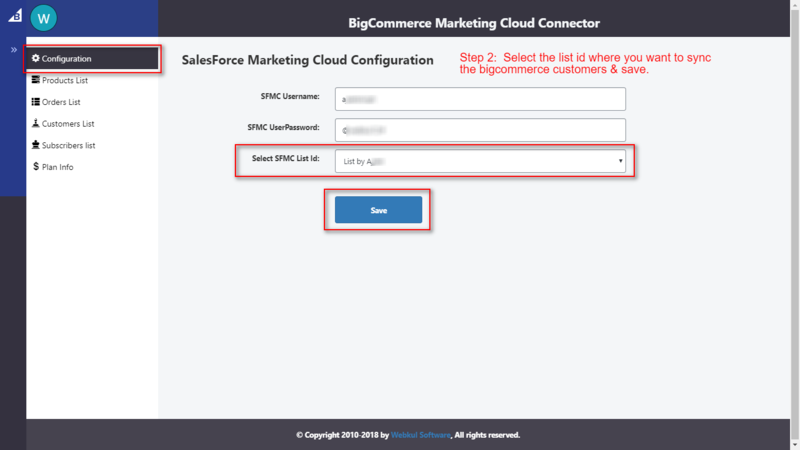 After successful installation, you will be redirected to the configuration page of the Marketing Cloud Connector as per the below screenshot. After saving the details, you will be asked to Select SFMC List-Id. 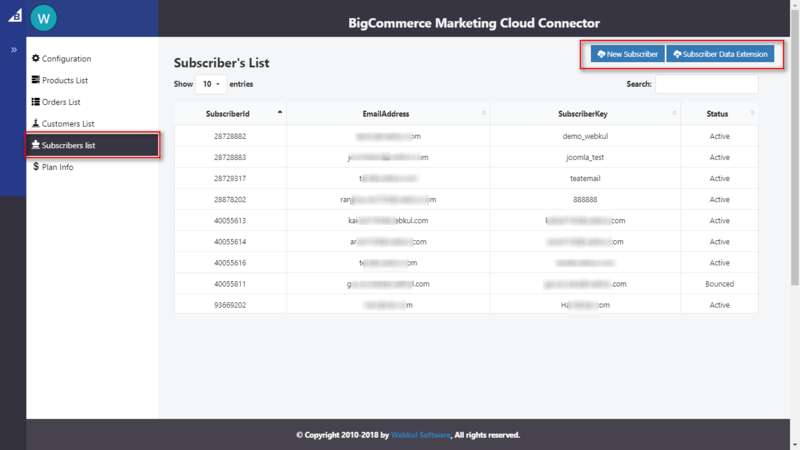 This is the subscribers’ list Id at marketing cloud where you want to export the existing customers of your BigCommerce store. Just select the list Id & save. It will sync your customers with the selected list id. So you can then manage your email marketing via marketing cloud. Just click on the Products List tab. The products at your BigCommerce store will be listed here. Click the export button provided for exporting these products to marketing cloud data extension. Just click on the Orders List tab. The orders received at your BigCommerce store will be listed here. Click the export button provided for exporting these orders to marketing cloud data extension. Just click on the Customers List tab. Here you can see all the customers at your BigCommerce store. Click the export button provided for exporting these customers to marketing cloud data extension. In this, you can view all the subscribers of the list selected in the app configuration. 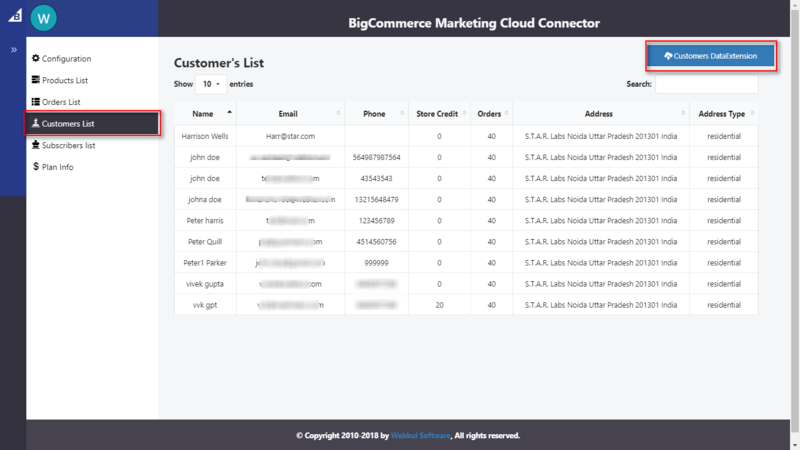 From here you can export the existing BigCommerce customers to the subscribers’ list data extension as shown below. Two separate buttons have been provided. 1. New Subscriber: It will add the BigCommerce customers to the subscribers’ list which are not in the marketing cloud subscribers list. 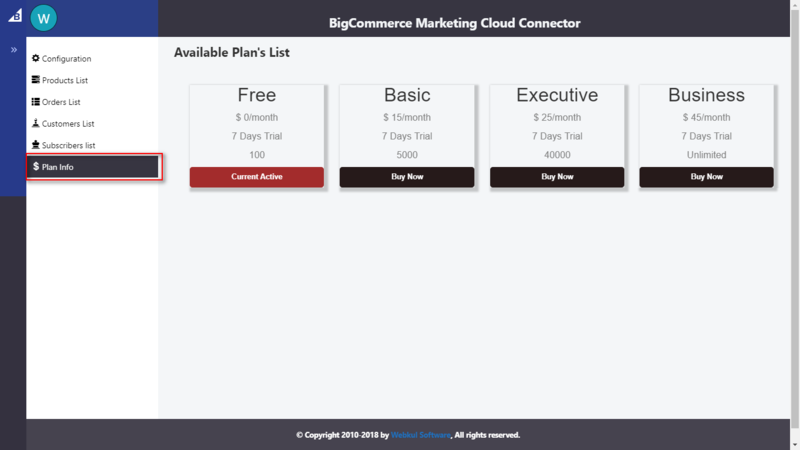 Here you can view the current plan & change your subscription of BigCommerce Marketing Cloud Connector anytime. Navigate to Email Studio-> Emails-> Subscribers->Data Extensions. The data ie; products, customers and orders will be exported here in these data extensions.